I must say that I am thrilled by the number of local businesses that have joined forces to raise awareness and funds for breast cancer education and research in the month of October. 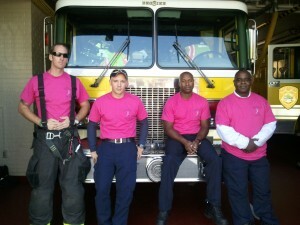 Last week the Middletown Fire Department was dressed in pink. They wore beautiful pink t-shirts tucked into their uniform pants and when asked, they happily posed for a group photo in their pink shirts! The shirts are currently on sale at the Middletown Fire Department. They are 20 dollars, so go purchase yours today to support the local community and breast cancer awareness! Last week I also bumped into CHC employee Laurie May, only to find her beautiful white hair decorated with a bright pink stripe and a pink feather. I asked her where she got her hair done and she pointed me in the direction of EG Salon. So, I walked down the street to EG Salon and when I arrived I found the salon beautifully decorated in pink. The stylist behind the counter explained to me that I could get a pink feather or stripe in my hair for $20 and that ALL proceeds would go to the Comprehensive Breast Center at Middlesex Hospital. So, I made an appointment for today at 2pm, to get my pink stripe! AmeriCorps member Rachel Schumacher accompanied me to take some photos! When we walked in, I was so happy to see that young girls and elderly women were all coming together to get their hair dyed hot pink in support of breast cancer!! Rachel took photos of me, documenting my experience. Not long after, I was taking photos of her in the stylist’s chair, getting her natural blonde locks dyed with a stripe of pink. Rachel was hesitant at first as she has natural blonde hair that has never been dyed, but the stylist gently coaxed her, and Rachel gave in to support a great cause. When she was under the dryer, I made sure to bring her a glass of pink lemonade and a cookie decorated as a bra. CHC employee Chiharu Romano was nearby getting her pink stripe as well! After our hair was finished the stylist took a picture of us and sent us on our way! It feels so good to know that people are willing to reach out and perform selfless deeds. The stylists, who were not profiting off of this service were thrilled to be fully booked with clients waiting for their ‘pink’. 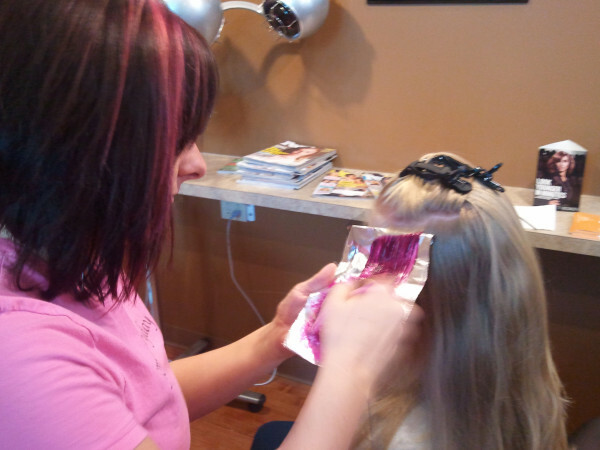 Please check out EG Salon’s website for more information on their ‘pink’ services for the month of October! Thanks to all CHC employees, community members and businesses who are sharing a common goal in the month of October to raise breast cancer awareness! 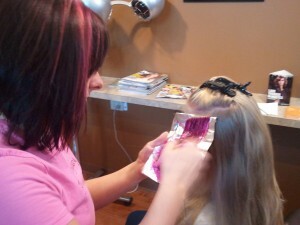 And thanks to Laurie, Rachel and Chi for going pink! Together we have raised $100 for the Comprehensive Breast Center at Middlesex Hospital! !